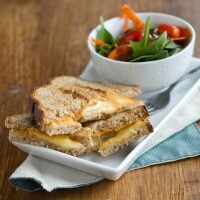 Hummus Grilled Cheese Sandwich | Naturally.Hummus Grilled Cheese Sandwich | Naturally. Preheat griddle over low heat. Brush the outsides of the bread with olive oil. On one piece of bread, spread with 1 tablespoon of hummus. Add cheese on top then finish with remaining tablespoon of hummus. Top with other slice of bread and brush outside with olive oil. Grill on each side until browning and cheese is melting, 3 to 5 minutes per side.